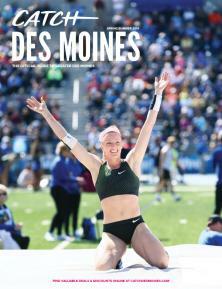 DES MOINES, Iowa (Feb. 7, 2019) – Catch Des Moines was awarded two 2019 Iowa Tourism Awards for Outstanding New Event and Outstanding Promotional Material. The awards were presented this afternoon at the annual Iowa Tourism Conference luncheon held at Prairie Meadows Casino Racetrack & Hotel in Altoona. Outstanding New Event honors an event/festival that was first held within the last three years (first held July 1, 2015, or after). The LPGA Solheim Cup and Catch Des Moines were awarded for the success of the prestigious event, held at Des Moines Golf and Country Club in August 2017. A new event attendance record was established – 124,426 fans attended the global golf tournament with an especially large crowd on Friday breaking the event’s single-day attendance record. The 2017 LPGA Solheim Cup created $32 million in economic impact in the community. Outstanding Promotional Material honors a tourism attraction or community for excellence in their promotional materials (print, TV, radio, outdoor, etc.). Any tourism-related promotional material is an eligible entry, including general or niche consumer publications, annual reports, etc. Catch Des Moines was awarded for the creation of Brew Moines, a beer passport app focused on connecting visitors with metro breweries and taprooms – creating a one-stop-shop for craft beer happenings in the Greater Des Moines brewery scene. Promotional materials included a “launch kit” for each brewery, including back-of-the-house information posters, table tents, coasters and examples of the koozies, keychains and stickers that would be part of the promotional “swag.” Branded T-shirts and mugs were used as level rewards and a microsite, brewmoines.com, was launched with reference information, prizing rules and more. From the June 16, 2018 launch through the end of Catch Des Moines’ fiscal year, the Brew Moines beer passport app was downloaded 3,109 times (that number was up to 9,406 at the time of submission). The Iowa Tourism Conference brings together travel and tourism industry representatives from across the state for three days of educational sessions, networking and the This is Iowa Legislative Showcase. The 2019 conference runs through Friday. For a full list of award winners or photos of the award ceremony, contact Jordan Powers at jordan@catchdesmoines.com.